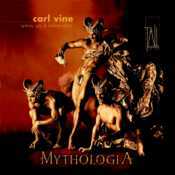 Mythologia is a dance score composed by Carl Vine, an Australian composer. It is a piece about Olympian fun and games--the athletic kind and the sexual (mostly homosexual) kind engaged in by the insatiably horny gods and demi-god groupies that frequent Mt Olympus. The chorus is used only intermittently to sing original Greek texts like Pindar's odes to Olympic athletes. Most of the time, synthesized sounds accompany the choreography. Some of those interludes are atmospheric and New Agey. Others are percussive or full of 'flying saucer' blips. Hercules and Omphale tryst again (like they did last summer) to an incessant beat as annoying as anything you'd hear on a disco dance floor. Mythologia is satisfying musically in being devoted to a single work, Vine’s score for a Murphy ballet of that name presented during Sydney"s Olympic Arts Festival last year. Vine worked with Suzanne MacAlister, an expert in ancient Greece, to create a kind of Pindaric ode. The Sydney Gay and Lesbian Choir, directed by Jonathon Welch, sings these texts capably enough within a quasi­orchestral, rock group and percussive context entirely created by Vine on computer. This score is an outstanding achievement. In a practical sense it confirms the worst fears of orchestral musicians in showing how flexibly and completely an electronically based piece of music can provide large-scale and varied sounds for the nightly repetitions of a major staged event. On the other hand, company administrators who believe this is the answer to improving the balance of their accounts should note that Vine’s capacity for using computers is creatively quite exceptional and that the vividness and resourcefulness of his timbres and patterning are informed by his very extensive experience in writing for ensembles and orchestras. The appeal of the recording. is enhanced by a booklet containing parallel texts and, satisfyingly detailed scenario for the ballet.